The documentary “The Breath of the Beloved”, directed by Murat Pay and produced by Kaplan Film, is a compelling film about a tradition that is slowly withering away: meshk and mawlid. We had a conversation with the director, who seeks to evoke some of our waning traditions through the young mawlid-reciter Abdurrahman’s story, about his film, mawlid, and the tradition of meshk. Meshk: An education system in Turkish music whereby the repertoire of musical works was transmitted across generations through a verbal and reciprocal master-apprentice relationship involving repetition and memorization. Mawlid: refers to a body of poems, but most commonly to a poem by Süleyman Çelebi titled Vesiletü’n Necat, about the birth of Prophet Muhammad, the various stages in his life, and his death. These poems are customarily recited at gatherings. The disappearance of meshk, which is the basis on which all the arts in our tradition are built, and the decline of the master-apprentice relationship have had a penetrating impact on the mawlid tradition as well. Based on this, we placed meshk to the center of our work. This was a decision taken by consultation. We were going to tell the story of a relationship between a master and his apprentice. When did the idea of making a film about the mawlid tradition come about? The starting point of every story is important, of course. I was touring around in Fatih one day with my wife, and we had taken our daughter along as well. I think we were expecting our second child then, if I remember correctly. My wife hadn’t been able to take the university entrance exams for a very long time because of the hijab ban, and I believe it was exam season around that time. We saw a second-hand bookstore somewhere near Kocamustafapaşa. We really enjoy everything related to books, you see. Because the storeowner was about to leave the business, he was selling books at bargain prices. We realized that he had some really good titles and picked up quite a number of books. Among those was the Mevlid-i Şerif (The Blessed Birth), published by Tercüman. Buying that book at that moment turned out to be an event that would have a considerable impact on our lives later, but of course we weren’t aware of it back then. Had you read the Mevlid-i Şerif before? No, I hadn’t read the text before, though I had listened to the mawlid… I can’t say that I listened to it very attentively. I grew up in a village; when we were kids we would go to mawlid ceremonies very often to drink sherbet. But I can’t say that I listened to the mawlid very often while in the city. To cut a long story short, the book entered our library, and after a long time my wife Ayşe picked it up and somehow made a habit of reciting the text in a certain rhythm to our daughter every night. This is what I mean by rhythm: “Al-lah a-dın zik-re-de-lim ev-ve-la / Va-cib ol-du cüm-le ol-dur her ku-la…” (He murmurs the verse) She recited the text in this rhythm; she had heard it from her own mother, and she from her father. So she started to chant the text to our daughter in that fashion. Neither of us could understand the words. She would recite the Mevlid-i Şerif every night. My daughter Leyla especially enjoyed the chapter on the birth of the Prophet and would constantly ask her mother to sing that part. She had a special affinity for that chapter. Since that time my wife tries to recite the mawlid to the kids before they go to sleep. These days she has been reciting miraciyye (works in verse written on the subject of the Prophet’s famous Night Journey), too. It coincides with the time I go to bed, so I inevitably listen to it. I could see that the text had a visible effect on my daughter. So I thought, “What could a text possibly have that would create such an impact even on a child?” Something that touches the heart of a child, but something that we think has been deserted in the past, something that even I don’t know about… As someone who’s active in cinema, such a subject of mystery naturally attracted my attention, and I thought that I should do something on it. I prepared the project and presented it to Semih Kaplanoğlu. After his approval we started to prepare for shooting. How was the preparation process? Did you have anything in mind regarding the genre? Gülzâr-ı Aşk by Hüseyin Vassaf Efendi. I intended to read it, but eventually I had to put it down because of its dense language. 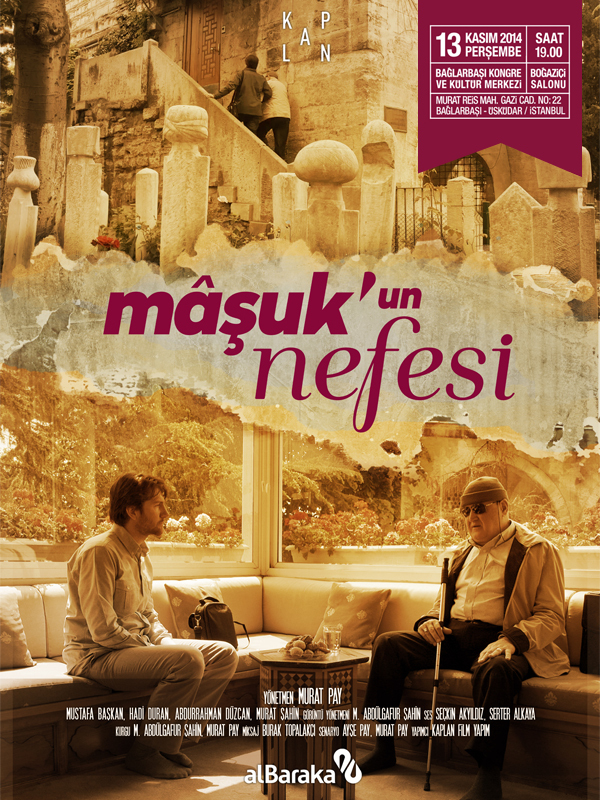 In the period after the initial shootings of the film, I had a feeling deep down that I wouldn’t be able to finish this work without reading Gülzâr-ı Aşk. And so it was. After the initial shootings I had to revise the script, but I simply couldn’t write- I couldn’t make any progress at all. Something told me that I would need to read Gülzâr-ı Aşk, and I read it. By the way I didn’t read it very attentively, nor did I understand very much, but I still read it. At the end of the book, in the commentary that he wrote on the mawlid, Vassaf Efendi says something along these lines: “You (Prophet) have been most gracious to us, and we cannot possibly be worthy enough to write anything about you, but you would still accept what we have written with all its shortcomings…” When I read these words, I came to my senses. I felt a strong pang of remorse. This is why: I had been running all over the place telling people that we were working on a project about our Prophet. What I didn’t realize was that when the matter concerns him, you have to have a very high level of etiquette. So instead I started telling people that we are working on a project about the mawlid. I unilaterally fixed that statement. This work is of course about the Prophet, but we can hope to cover as much ground and touch the heart of the matter as much as is destined for us. The disappearance of meshk, which is the basis on which all the arts in our tradition are built, and the decline of the master-apprentice relationship have had a penetrating impact on the mawlid tradition as well. Based on this, we placed meshk to the center of our work. This was a decision taken by consultation. We were going to tell the story of a relationship between a master and his apprentice. There were going to be one master and one student; it couldn’t be otherwise. Then we set our boundaries: the film would take place in the present time. This led to the question of whether a man of our times would ever want to enter an apprenticeship in the art of mawlid. We wrote the script as if there were indeed such a person: a master and an apprentice that wants to practice meshk in mawlid. And a story that develops between these two. We set the framework. Based on it we came up with a budget for the script. In the documentary business, substantial sponsorship is crucial. If our sponsor hadn’t been so supportive, we could possibly have made no further progress and would have had to constrain the scope of the project. Did you have any difficulty with casting? We wanted to decide on the master first. Finding the master was a difficult process. We settled on some, but then they didn’t quite work, and we had to meet with others. We met with a lot of people, repeatedly. Out of all these different individuals we settled on Âmâ Mustafa Hoca, whom we met in the vicinity of the Süleymaniye Mosque. However, as per the script, we needed two masters. Mustafa Hoca said that he would accept the offer on the condition that Hadi (Duran) Hoca get involved as well. I had met him only recently, and to be honest he had a fair point. Hadi Hoca was an authority in the field of mawlid; he was exceptionally good in recitation, instruction, and vocal technique. Hadi Hoca agreed to take part in the project. After we determined the masters, we moved on to the apprentices. Our method was to send word to the mawlid masters in town and ask them of any young men that want to be apprentices in mawlid recitation. As a result of this inquiry we accumulated roughly 20 names in our records. These candidates came, and we held an audition by asking them to recite sections from the mawlid and other religious poetry. And of course, the part mattered too… At the end of the day it was also a question of acting, no matter how little, so we asked them to act in a couple of scenes to gauge their camera compatibility. We also asked the ones who played instruments to perform in front of the camera. The first person that we thought could work well for the part was Abdurrahman (Düzcan). Of course, we had to be sure. We first took into consideration how we felt about him, then his acting abilities. After much elimination we were left with two candidates. I spent a week each with these two individuals. I went to their workplaces and the places where they practiced meshk. We asked about them to masters of mawlid with regards to their vocal abilities, and finally we decided on Abdurrahman. A strong factor in our preference for Abdurrahman was the fact that he is a hafiz (a person who has completely memorized the Quran) because this is a very important quality in a mawlid-reciter. In the tradition there is almost no mawlid-reciter that is not a hafiz. Did Âmâ Mustafa Hoca and Abdurrahman know each other beforehand? No. We didn’t even allow Abdurrahman to talk to him before the scene where he meets his master. That’s when they first met. Abdurrahman didn’t even know about the scene where his initiation would be discussed. Neither did he know how his master would react when he rang the bell the first time. We left Mustafa Hoca in charge of these matters. Was it Mustafa Hoca’s idea to turn Abdurrahman away by telling him to “come back next week, come back next week”? There were such details in the story, of course. But we told the Mustafa Hoca to act as he liked in case the man didn’t appeal to him. We tried to turn ourselves into spectators and to avoid interfering. We struggled to keep the authenticity intact: that was our guiding principle. When we did interfere, we tried to do so only to maintain the unity of character for each person. In those first four weeks we shot the scenes that we call the meshk scenes. As the meshk progressed, a sort of affinity formed between Abdurrahman and the master. So there are a considerable number of improvised scenes? Yes. Recall Hadi Hoca’s meshk scenes; there was almost no interference from us in those scenes as well. It wasn’t really a question of writing a dialogue; what we told the master most frequently was “Master, we would like to see such and such a conversation.” How would this conversation be? Where would it go? What kind of detours could it go into? Where would it stop? We didn’t interfere with any of that. In this way we obtained a whole heap of material, and we edited them. Then we realized that we would need to revise the script for the authentic meshk atmosphere to translate a little better into film language. This is when the story that I told above about Vassaf Efendi happened. I was at a dead end with the revision, but after I read Vassaf Efendi’s Gülzâr-ı Aşk, we resumed filming. What role do the scenes in which you weren’t mere “spectators” play in the story (such as Abdurrahman’s broken lamp, the prayer beads that got lost in the Ulu Camii)? At the end of the day man isn’t just an automaton; there is our quotidian existence. That lamp story was a detail designed to give us some access into Abdurrahman’s daily life. We also wanted to have a story parallel to the one about the master-apprentice relationship. Abdurrahman couldn’t take care of it on his own… we were trying to convey the principle of entrusting every affair to the one qualified to handle it. Every part that we included in the film and described as fiction actually stems from things that I have either read about or heard of; what I mean is, I didn’t come up with any of the material completely off the top of my head. For instance, the prayer beads… These stories are factual; teachers would entrust their prayer beads to someone’s safekeeping. That’s why I believe that our film has a strong base of reference to the documentary genre. Meshk is a key; meshk opens everything. Memorizing the Quran, as you know, happens through a similar process of apprenticeship and reciprocal recitation. There is the teacher, there is his student, and together they practice the memorization of the Quran. The word meshk comes from “aşk”, which means affectionate love. The key point here isn’t just the transmission of knowledge, but also the transfer of a certain state of mind. The teacher transmits good manners (edep). In sum, we can say that this affectionate love acts as a catalyst for the transmission of good manners and etiquette. What do you think about meshk, one of the central themes of your film? Meshk is a key; meshk opens everything. Memorizing the Quran, as you know, happens through a similar process of apprenticeship and reciprocal recitation. There is the teacher, there is his student, and together they practice the memorization of the Quran. The word meshk comes from “aşk”, which means affectionate love. The key point here isn’t just the transmission of knowledge, but also the transfer of a certain state of mind. The teacher transmits good manners (edep). In sum, we can say that this affectionate love acts as a catalyst for the transmission of good manners and etiquette. One of the most important aspects of meshk is its power to enable one to attain a quality that has an incredible capacity to deepen itself. That’s because in meshk you have a personal, one-on-one contact between the teacher and the student, and the student learns to absorb the good manners, ethics, and the knowledge emanating from his teacher and to adopt them to his life using his own methods, without losing from his selfhood. Subsequently he brings forth these qualities in his person in a completely unique manner. In my opinion, because meshk has its roots in affectionate love and the essence of being human, it is something that has to exist as long as man exists. A story is told at the very beginning of the movie: an apprentice goes into the dervish lodge and says, “I know three thousand hymns,” and the master responds, “Everyone here knows three thousand hymns.” The question is: in the world that we live in today, do we really need such intense memorization? This is a very good question. There is a reason why we placed this scene at the beginning of the movie. The central point of meshk isn’t just a dry memorization. If one memorizes in that dry manner, he can’t keep it in his head anyway. So the question here is: does recording kill meshk? I say this with regards to traditional music. Meshk in the context of music proceeds on the principle of not recording. For instance, we know that some musical works whose meshk was discontinued haven’t been able to survive. Some works cannot be performed today. Why? Because the tradition of meshk ended in the 1900s and couldn’t survive to our day, and as a result people don’t know how to perform certain works. If we are to address contemporary concerns, then I think we should give up on neither. Both meshk and recording should continue. The decline of meshk hurts the authenticity and sincerity of this endeavor. We need to think about these things. For meshk to take place you need the atmosphere; formerly they had the appropriate milieu. Now the milieu has changed; cafes, coffeehouses, stadiums… As long as the milieu is there, meshk will survive. If we facilitate the flowering of both meshk and the milieu, then we can reap the benefits of technology. Finally, there is a brief scene in the movie that alludes to discussions about the question of mawlid being bid’a (here: an undue and reprehensible innovation in religion). Could you comment on your opinions and attitude on this subject? Translation from Turkish into English by Hüsna Hamiyet Bayram. Please type '559' into this field.